Trends that are picking up steam include new food-centric hotels; destination breweries off the beaten path; food halls and hubs; forest bathing and spa treatments en plein air; and (where cozy and epic meet) fireplaces with a view. The Cambria Downtown Asheville brings Havana to the Blue Ridge with Hemingway&apos;s Cuba restaurant and bar. Set next to the historic Grove Arcade shopping complex, the hotel and its rooftop restaurant offers views, Cuban cocktails, croquettes and ropa vieja. Asheville’s famed Art Deco skyline will get a new icon and a four-star luxury property when Hotel Arras opens. In addition to a completely new Art Deco façade for Asheville’s tallest building (formerly the 1960s-era BB&T building) the 128-room hotel will offer an extensive food focus with two restaurants by local chef Peter Pollay of Asheville favorite Posana. The first restaurant to open will be Bargello, Mediterranean-inspired with house-made pastas and whole fish preparation. Opens late 2018. Preservation of the distinctive character of an important Asheville neighborhood will be the focus as three historic buildings are reimagined as the Asheville Foundry Inn, part of Hilton&apos;s upper upscale Curio Collection, opening mid-2018. Set on Eagle and South Market streets, this hotel will be part of The Block, Asheville&apos;s historical business district for the African-American community. TIP: Hop on the Hood Huggers tour for stories of resilience highlighting new historic markers, art and interactive interpretation on The Block and across Asheville. Colorfully restored 1950s campers, just 12 minutes from downtown Asheville, are available at the new JuneBug Retro Resort, a 50-acre property that transports visitors back in time to when folks vacationed in the original tiny houses. More than 45 film costumes are on display at Biltmore February 9 through May 13 as part of the new exhibition, "Glamour on Board: Fashion from Titanic the Movie." Lavish costumes represent the extensive wardrobes required by transatlantic travelers like George and Edith Vanderbilt on these "Floating Palaces.” This is the first large-scale exhibition of fashions from the film, which won a record 11 Oscars. Learn about the Vanderbilts&apos; many travels and the family’s eerie connection to the ship. More info. Experience the breathtaking large-scale glass sculptures of Dale Chihuly at Biltmore May 17 through October 7. "Chihuly at Biltmore" is the first-ever art exhibition in Biltmore&apos;s historic gardens. On select evenings, Biltmore House and Gardens will be open for special viewings after dark. "Chihuly Nights at Biltmore" combines these spectacular installations with dramatic lighting and Blue Ridge Mountain sunsets. More info. America’s Most Visited Winery now hosts a Winery Production Tour, highlighting how science and nature meet in winemaking, the unique factors of grape growing in North Carolina and the craft of fermentation. Recent renovations at Biltmore Winery include enhancements to the tasting room and a new premium wine bar with outdoor seating. 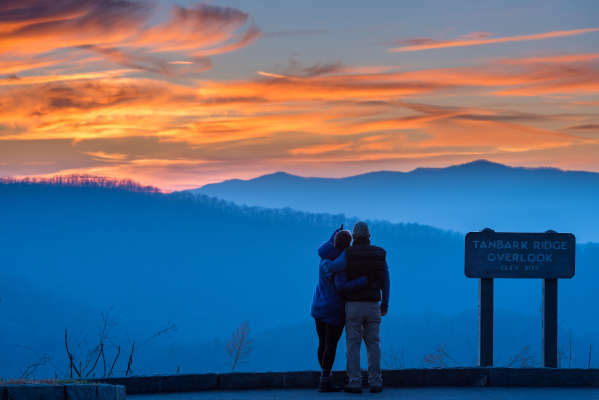 Often ranked among the coziest cities in America, Asheville’s (mostly mild) winter weather means a vibrant walkable downtown, picture-perfect long-range views of snowy peaks, romantic restaurants and bars and hiking trails all to yourself. Fireplaces with a View: From rooftops to cozy spots to imbibe, Asheville’s trend of fireplaces accompanied by spectacular vistas continues with the new rooftop restaurant bars Capella on 9 at the AC Hotel Asheville Downtown and Hemingway’s Cuba at Cambria Downtown Asheville, offering warm views of downtown architecture and mountain scenery. Other hot spots with epic fireplace offerings: Omni Grove Park Inn, Pillar Bar at the Hilton Garden Inn Asheville Downtown and Wicked Weed Brewing. Manhattan Service for Two: A vet in Asheville’s craft cocktail scene opens Little Jumbo, serving up cozy with class at the edge of the historic Montford neighborhood. Check out the date-worthy Jumbo Service, an interactive cocktail experience for two. Your Personal Sommelier: French restaurant Bouchon just opened L’Ecluse, a comfy, romantic hideaway above a beloved local restaurant. A dedicated sommelier will help you pick the perfect beverage. Floral Sips at a Botanical Boutique: West Asheville’s Flora now includes a coffee and tea bar with flower-laden ice cubes, planted interiors and a fresh-cut flower bar. More Drinking Chocolate, Please: Known for bean-to-bar creations and delicious drinking chocolates, including the Liquid Truffle sipping chocolate, French Broad Chocolates is opening a new café and creamery in their factory’s current South Slope location. The factory will move to a larger space at RAMP Studios. Asheville’s Summer of Glass: The quartz-rich mountains and Asheville’s passion for creativity give the region a prolific glass art history. In conjunction with the Chihuly exhibition, Asheville glass artists and studios are celebrating the historical and contemporary context of glass and its talented artists with tours and demonstrations of glass blowing, jewelry making and stained glass May through October. Craft City Food & Art Tours celebrate the best small-batch, high-quality and handmade. Asheville’s Center for Craft, Creativity & Design, the epicenter of Asheville’s maker culture, joins local food experts for a walking tour that features tastings, exhibits and demos from Asheville’s unique makers and crafters. Painting with Beer joins the palette of uniquely Asheville art immersion experiences via Asheville Art Studio Tours. Explore studios across the Asheville art scene and end with a beer painting lesson at one of 38 local breweries. Asheville was recently named one of Zagat’s most exciting food cities in the country, and one of the city’s hippest hoods, West Asheville, has an exploding food scene all its own with new restaurants BimBeriBon (global bites and superfood-enhanced fare), Foothills Butcher Bar & Kitchen (cleavers as décor and a second location in Black Mountain) and Gan Shan West (Chef Patrick O’Cain brings dumpling and noodles counter service to Beacham’s Curve). Award-winning Looking Glass Creamery is now offering cheese classes and a newly expanded tasting room at their Fairview farm. The family recently purchased a dairy farm in the region where they have launched a cave aging program and will double cheese production. Spices are available fresh, whole and small batch at the new Spicewalla spice factory by James Beard-nominated chef Meherwan Irani. Irani, dubbed the “spice whisperer” and chef/owner of Indian street food restaurant Chai Pani, hopes to encourage folks to use Indian spices in unexpected ways. Asheville B&Bs stake their claim for Asheville’s best breakfasts with Morning in the Mountains, a collection of 100+ recipes that highlight the culinary expertise of the Asheville Bed & Breakfast Association. Asheville’s passion for global cuisine will take center stage as the Asheville Wine & Food Festival marks its 10-year anniversary with a chef’s showcase series and lively culinary village in the heart of downtown, August 17-18. An Art Deco Culinary Complex is bringing the food hall trend to an architectural icon in downtown Asheville. S&W Cafeteria reopens as a multi-venue food hall—S&W Artisanal—that will include restaurants, a bakery, a coffee bar, a Greek market and a newly opened 20s-inspired bar, The Times. The great-nephews of architect Douglas Ellington, who designed the building in 1929, are behind the venture. ALSO NEW: White Labs, a major supplier of yeast for breweries across the nation, has opened White Labs Kitchen & Tap, serving woodfired pizzas made with White Labs’ pure liquid yeast and other fermented and beer-infused dishes and desserts. Twenty-eight taps offer side-by-side tastings of beer fermented with different yeast strains. Destination Breweries: Breweries are popping up outside of the downtown core with their own unique appeal. Recent additions include Turgua Brewing (farmstead brewery in Fairview), Ginger&apos;s Revenge (alcoholic ginger beer in the RAMP Studios), Zillicoah (sours and lagers in Woodfin) and Eluvium (Weaverville). Next, Burial Beer Co.&apos;s Forestry Camp, set on a historic property near Biltmore Village, will give new life to buildings that once housed the young workers who built the Blue Ridge Parkway. The beer bar is set to open in late winter or early spring. Beer Week Goes Outside: New this year, the event will integrate outdoor adventure like hiking, biking, Onewheel and yoga. Dates: May 25 – June 2. The week, organized by the Asheville Brewers Alliance, closes with the Beer City Festival on June 2. Cider in the South Slope: West Asheville&apos;s Urban Orchard Cider Co. has announced plans to expand to a second location in Asheville&apos;s South Slope beer district. A springtime opening is predicted for the taproom, with more than 30 taps of cider and beer. New at Asheville&apos;s Oldest Brewery: Highland Brewing Company is rebranding under the second-generation leadership of Leah Wong Ashburn, daughter of creator Oscar Wong. Updates include packaging, a fresh tasting room and programming that occurs at the brewery&apos;s rooftop bar and meadow. Trail with Hollywood Ties Reopens: The popular Skyline Trail that leads to the top of 404-foot Hickory Nut Falls in the Chimney Rock section of Chimney Rock State Park has reopened after being closed for almost 10 years. The area near the top of the falls (where the final fight scene in the 1992 film The Last of the Mohicans occurred) once again provides guests with incredible panoramic views. Perfect Picnic Trail Expands: Bearwallow Mountain Trail, a Hickory Nut Gorge-area trail known for its Instagram-worthy views, grazing cows and spring wildflowers, now has a new neighbor trail. The 3-mile Wildcat Rock Trail goes to a 100-foot waterfall, towering cliffs and panoramic views. The trail is a national-award winner, receiving recognition for trail design and construction from the Coalition of Recreational Trails. Just announced: Thanks to new Conserving Carolina conservation easements, this trail will extend across the mountain to connect to Bearwallow Mountain in the next few years. More info on the Bearwallow Mountain Trail. What is an Adventure Spa? Ascend Adventure Wellness combines hiking and outdoor spa treatments for the ultimate forest bathing experience. This pop-up spa in the wilderness was started by a former Outward Bound instructor-turned-masseuse. Asheville hosts the Fed Cup, the world&apos;s largest annual women&apos;s team tennis tournament, February 10-11. The U.S. team will play the Netherlands and both Sloane Stephens and Coco Vandeweghe, members of this year&apos;s title-winning club, are expected to be able to compete. Haute Route, a prestigious European cycling event, races into Asheville May 18-20, bringing more than 300 international riders and cementing the area as a world-class cycling destination. Each stage of the event starts and ends downtown with riders navigating the highest peaks east of the Mississippi River. The FEI World Equestrian Games, the largest sporting event in the United States in 2018, takes place in nearby Tryon (45 minutes southeast of Asheville) September 11-23. The games, expected to attract nearly 500,000 people from more than 70 countries, include competitions such as jumping, dressage, endurance, vaulting and reining. More info. New breweries Whistle Hop (antique train caboose and disc golf course), Turgua (farmstead brewery with lots of room to run) and Archetype (live music, toys and story time) join a scene of family-friendly breweries that include circus themes, arcades and movie theaters. Treetop Fun for Tiny Ones: Known for celebrating the smallest thrill seekers, the Adventure Center of Asheville has added a new trail for children ages 4 to 8 on its Treetops Adventure Park. The course, with elements like beam walks and cable bridges ranging in height from ground level to 8 feet off the ground, joins the park’s Kid Zip zipline for children as young as 4. The Blue Ridge Music Trails of North Carolina guidebook leads travelers to where folk music and dance still thrive and includes a 20-track companion CD for the drive. A NEW version of the guide launches this spring with stories about musicians young and old, venue and festival listings and info about fiddler&apos;s conventions, sacred music singings and community jam sessions. Email Media@ExploreAsheville.com to gain the password to the image gallery.